The Iwasaki File Co. in Gunma Prefecture is making quite a splash in the woodworking world with its amazing "chemical polishing" technology. Known in the West as razor files, these tools have specially formed teeth and grooves that result in removal of wood that's faster than rasps and smoother than files. No pressure needed! To top it off, the design keeps the file clean of removed material automatically. The files also sport a safe edge to keep adjacent workpieces - and fingers! - safe from their bite. Great for use on plastics as well as wood, these are some of the best files you'll ever find. 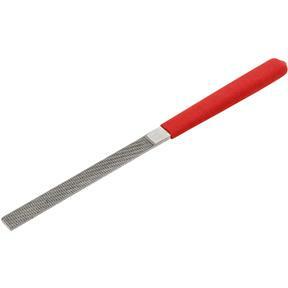 This 8" flat file cuts on the push stroke and has a textured handle that measures 3-3/4" long. 3/8" wide, extra fine tooth pattern.